Pyramid Digital Alarm Clock Only $3.66 PLUS FREE Shipping! Color Changing With Thermometer! You are here: Home / Great Deals / Amazon Deals / Pyramid Digital Alarm Clock Only $3.66 PLUS FREE Shipping! Color Changing With Thermometer! What a fun little alarm clock! 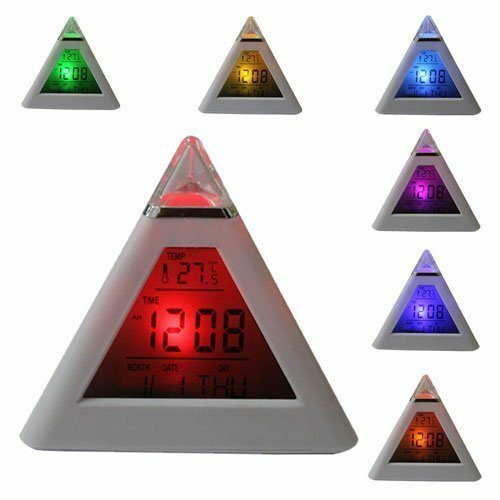 The Pyramid triangle alarm clock has a 7 color changing LCD digital display with thermometer! Get the Pyramid Digital Alarm Clock for Only $3.66 Plus FREE Shipping! Will make a great gift for sleepyheads & the college bound (which may be the same person! lol)!